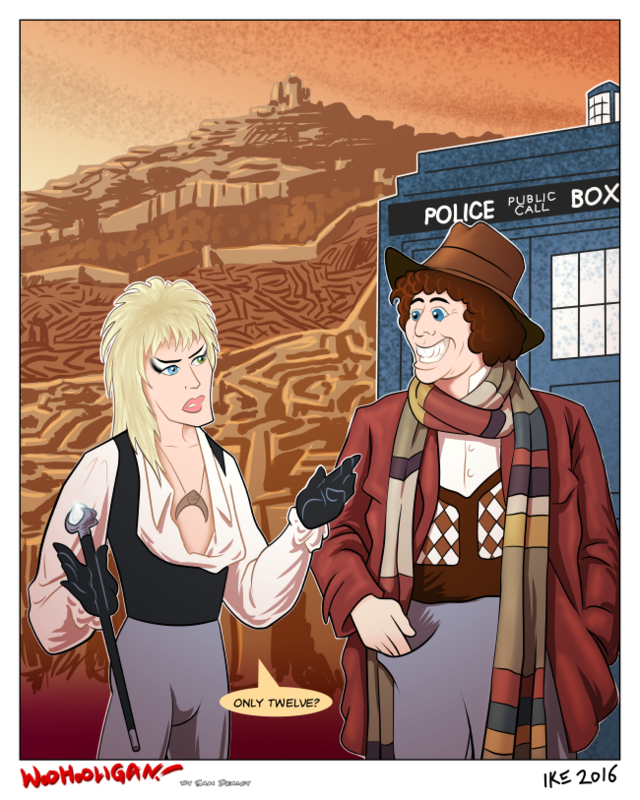 You know, it's really remarkable to me how natural Jareth and the Doctor seem together. It's not just that Bowie had about twelve different personas throughout his career (mostly the early part, between Ziggy Stardust, the Thin White Duke, Aladdin Sane, etc. ), but I could totally see the labyrinth as the Tomb of Rassilon in the Five Doctors movie. I realize I'm a little late publishing my tribute, as everyone else published theirs two weeks ago when Bowie died... but I wanted to get this out and I didn't want to rush it because I wanted to give him my full attention. Bowie is one of those celebrities who, I always felt like I should probably know more about, because I actually didn't follow his music much. Yes, I enjoyed Space Oddity and the Labyrinth quite a bit, but mostly I remember always being very impressed with whatever Bowie had to say. He always struck me as a remarkable human being more so than his work. I've seen people say that he lied about being bisexual throughout his career, to which I say, who cares? So what if he did? He had the guts to say it in the 80s when it was still quite dangerous for the average person to admit to being gay. He called out MTV for their blatant racism in their early years, only showing videos from black artists in the wee hours of the morning. Whatever you might think of his work, Bowie had the conviction to speak truth to power. He will be missed. For those of you wondering who that other guy is in front of the TARDIS, you should really watch Dr Who, not just Moffat's stuff... Honestly, the old stuff is much better. Moffat doesn't seem able to write anything that's not a cliche or trope. We get Moffat and suddenly Cybermen are exploding "because LOVE!" Weak tea, man. There's a high-resolution copy of this image available to all my patrons to use as a desktop wallpaper, print out, etc. on our Woohooligan Patreon page.